Did you know that every single major league baseball team has a Google+ page? Or that hundreds of professors across the country are using Google+ to hold virtual office hours? Or that every U.S. presidential primary candidate has agreed to participate in live hangouts with voters on television this election cycle? 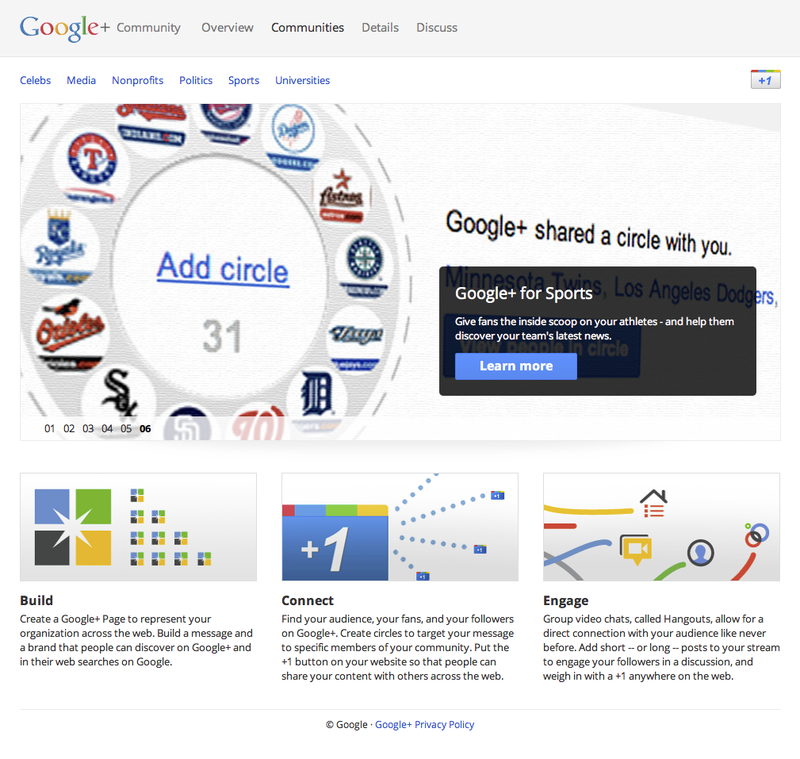 As Google+ continues to grow, we’re seeing more and more communities develop on the platform. But we want to help more organizations, politicians, artists, celebrities, athletes, media companies and nonprofits use Google+ to share and interact with each other—and with Google+ users. That’s why we’re launching a series of community guides to help your organization thrive on Google+. On the site, you can find out how to get your organization started on Google+, and learn how other groups like yours—universities, political organizations, nonprofits, sports, media companies and celebrities—are using the platform. You’ll find case studies and ideas for how organizations or individuals in each of these communities have used Google+ effectively. For example, you’ll see how NBC’s Breaking News Google+ page is using the platform to deliver breaking news; or how the Dallas Cowboys are using hangouts to connect with fans; or how celebrities like Conan O’Brien are announcing their Google+ pages to the world. There are thousands of vibrant communities on Google+. We hope these new community guides will help you and your organization connect, follow and share with the communities you care about the most. Finally, we’d love to hear how you’re using Google+ to engage with your communities. Make sure to share your greatest successes with us on the Google+ page.